Mary Fedden was a British artist whose finely executed paintings often took the form of a hybrid between a still life and a landscape.This painting is typical of a Fedden piece with a group of objects fruit, bowl and table depicted in fine detail in front of a striking background scene. These intriguing combinations illustrate the depth of vision, both in a figurative and literal sense, which Fedden portrayed in her paintings. A fine example of Mary Fedden''s art work. Dated in 1991. 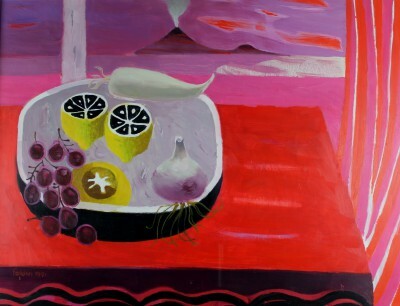 It displays the classic characteristics of Mary Fedden''s use of bold, vivid colourful views of Italy. Click here to view more contemporary paintings by Mary FEDDEN.